TNT revealed the players coming out of the respective Eastern and Western Conferences who've been voted in as starters for the 67th NBA All-Star Game, on Thursday, January 18. 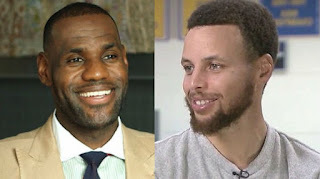 Along with news of who will be taking the floor for the tip-off, it was announced that as the top vote-getters, LeBron James and Steph Curry, have been named opposing team captains. Among those coming out of the East will be Giannis Antetokounmpo, Joel Embiid, Kyrie Irving, and DeMar DeRozan, in addition to Lebron. And from the West, James Harden, Kevin Durant, Anthony Davis, and DeMarcus Cousins will join Steph Curry on the court, although it isn't likely that a combination of four Western Conference players will be in the same uniform as Curry come February 18. Neither is it likely that an all Eastern Conference team will compliment LeBron, as has been custom throughout the history of the star-studded exhibition. The league has switched up the format this year to allow the two captains to draft any player they choose from the combined pool of starters. Thus, it wouldn't be out of the question for LBJ to be passing balls out to KD, or for Pelicans' Davis and Cousins to be separated on to opposing squads. There will no doubt be an element of intrigue surrounding the revised rosters when they are announced on January 25, as many will no doubt have an eye on whether or not LeBron picks Kyrie up, or if Curry grabs someone over his former MVP teammate.